Some 2,000-plus years ago, the holiday today known as Halloween originated as a New Year’s Eve celebration among the Celtic peoples of Europe. The Halloween we celebrate today is a mix of ancient Celtic traditions, Catholic and Roman rituals, and European folk practices blended over time. King James I published a book of “Daemonology” in 1597. It was a handbook on how to recognise and destroy witches. We discover how it sparked a viral outbreak of witch-hunting. Gathering of Witches, 17th century print. 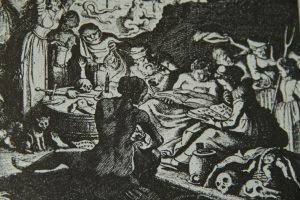 Analysing a remarkable new archaeological find, we discover the disturbing truth behind the legend of the vampire. 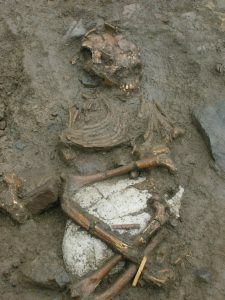 The film connects the discovery of skeletons found with large stones forced into their jaws, with 11th century records suggesting that our ancestors were haunted by powerful fears of the undead. The film discovers that the same fear continues in the 21st century; we interview a Romanian villager who saw his neighbours cutting the heart out of a corpse that they believed to be a vampire. A cracked funerary plaque that once adorned a beautiful woman’s grave now tells of one man’s grotesque attempt to bring his love back from the dead. 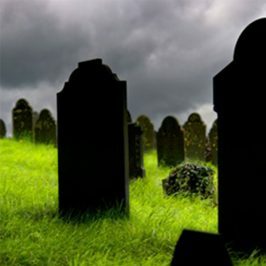 How much of the vampire legend is based in reality? Jamie Theakston travels across Europe to see if there is a link between the legendary bloodsuckers and historical figures Elizabeth Bathory and Vlad the Impaler. Bram Stoker penned his gothic horror Dracula in 1887 and popularized the modern vampire myth—but Vampire Legend uncovers evidence that now points to those myths originating in England, not Eastern Europe as many believe. Unexplained burials, identified as ‘deviant’ and ‘cursed’ by their contemporaries, were detailed in Stoker’s original research notes and drafts, discovered by his great-grandson in the family archive. 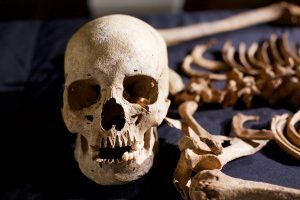 Oxford professor John Blair follows clues in medieval burials in England that may offer insight into physiological reasons for the formation of the myths. The cases hint at a deeply-held belief that the dead could rise and bring fear to the living… a belief that predates the Eastern European lore and is forcing a re-examination of the modern vampire legend. Jamie Theakston ventures beyond the world of orthodox religion as he probes the Church of Satan. Learn more about their philosophy as Jamie goes underground.